Ladies and gentlemen! 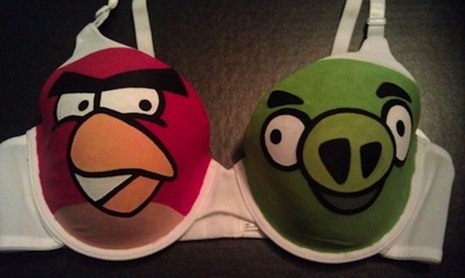 We present to you: The Angry Birds Bra aka Angry B**bs. 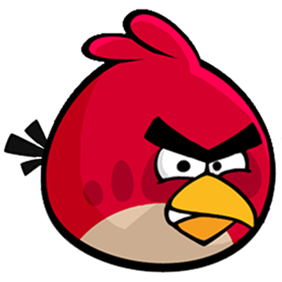 Angry Birds, developed by Rovio Mobile, is a popular series of puzzle-based video games which involve throwing little angry birds at mischievous pigs placed in different configurations on different levels. The first game, simply titled Angry Birds, was released on the App Store back in 2009. Today, it is the most popular game on every iOS device, namely the iPhone, iPad and iPod touch. The series was then expanded with games like Angry Birds: Seasons and Angry Birds: Rio. These days, the birds can be catapulted from many different platforms: iOS, Android, Windows Phone 7, Symbian^3, PS3/PSP, Windows, Mac, Google Chrome and today: from a female’s br**sts! OK, you may not actually be able to send those birds flying into the air with what we’re featuring today, but we needed a transition into today’s story and, well, this is what we’re hanging on to (pun intended). As you can see in the image above, they have been custom-made by SceeneShoes over on Etsy, and they feature one of those evil, green pigs as the left cup and the iconic red bird for the right cup. It costs a somewhat reasonable $35 and is available from sizes 34A to 38DD, so you can be sure to find the right size for le woo-woos. It isn’t officially licensed by the developers of Angry Birds, so there are chances that these custom-made under-garments will be stopped from selling soon. SceeneShoes also sells other interesting items like pokeball shoes, Mario & Luigi shoes, among other things. Good stuff! If you don’t have any one to gift this to, why not get one for yourself? You can always use it as a slingshot!